it makes sense to buy a party dress when you stumble across one. If you have one winter/fall dress and one spring/summer dress for special occasions, you are all set. * You can sit back and wait for invitations to weddings, fundraisers, and award dinners to arrive. I have so much wisdom to impart today. Lesson No. 2: Putting on a massive piece of glitzy jewelry can convert a borderline dress into a dressy dress. For instance, I have worn this charming black dress to work with black flats. But with Tutankhamun** around my neck, I am ready for an evening event. This epic necklace was a gift from The Photographer. It looks like it was stolen from a pharaoh’s tomb, but in fact was manufactured recently and is made of gold plated copper wire. It’s incredibly light. 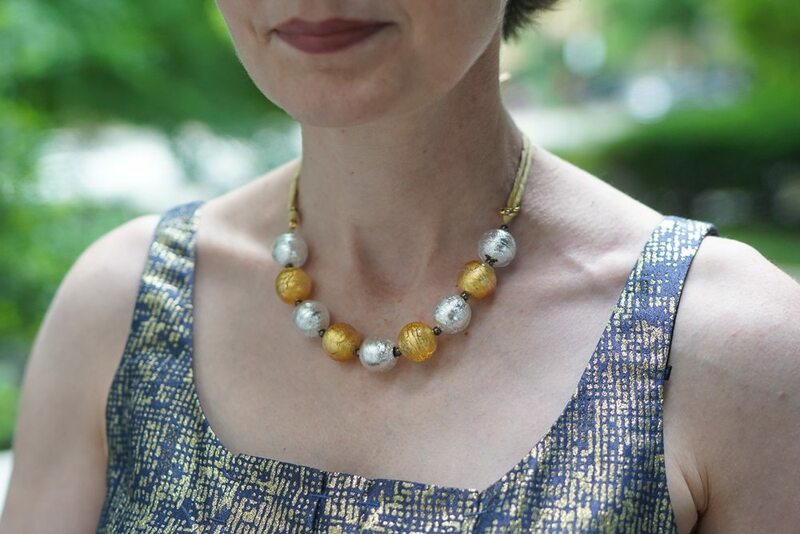 The necklace was originally 16 inches long, but it felt too tight — I think because this braided wire does not drape or mold the way a chain or string of beads does. A too-tight necklace will not serve! I thought about sending it back to the maker and asking him to put an extender on the clasp and then I had an idea. I realized I could remove the existing clasp, thread silk cords through the remaining eyes, and then tie the necklace at any length I wanted. I got on Etsy and ordered a skein of mixed yellow and gold cords, figuring that one of them would work. I need to trim these cords so that the bow is smaller and tighter, but I want to leave enough cord to permit a range of lengths. With a different neckline, I would make the necklace longer. You will need a pair of shoes and a little bag to go with your party dress. Black is a safe bet. a gold heel — that adds a little glamour and presence. This is my summer party dress. Is it purple or gold? 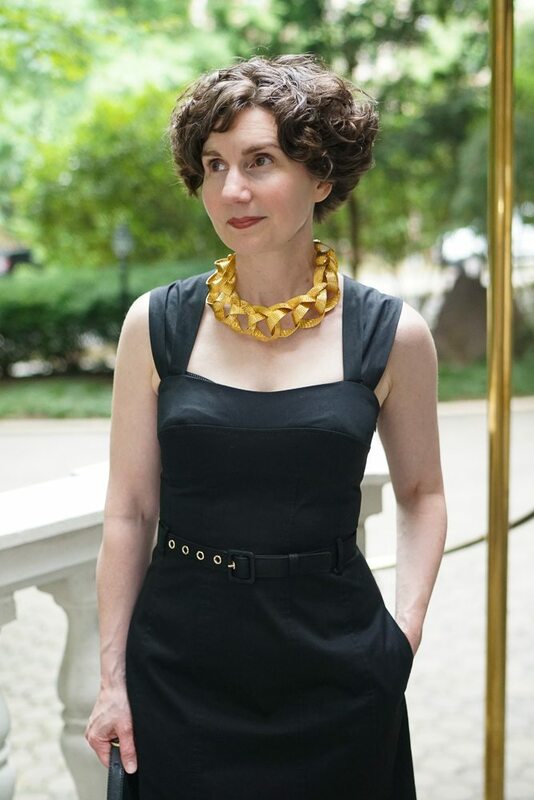 I figured I’d try the gold necklace with the gold dress. A few words about the dress. As you can see, the skirt is full and stiff — so it’s not the most flattering shape. I don’t look svelte in it. But it’s compelling, right? 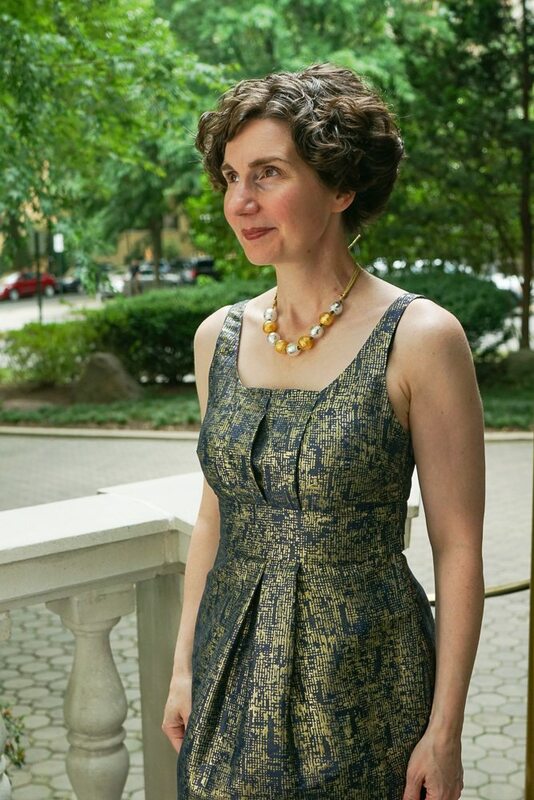 When I bought this dress several years ago (Gilt? YOOX? ), the skirt was fuller and stood out farther, and more bizarrely, than you see here. Fatima slimmed it down for me. Perhaps not the most conventionally flattering silhouette . . . But very pleasing all the same! I decided King Tut was too much with this dress — the gold of the necklace was so bright that it made the dress appear dull. Fortunately, I remembered something else that was in my jewelry drawer. A week later, the bracelet was delivered to my office by a bike courier with the most charming note. I believe Vladimir Putin came to own Robert Kraft’s Super Bowl XXXIX ring under similar circumstances. Thinking about the bracelet, I had another idea. Why not convert the bracelet into a necklace? Lesson No. 4! I had worried about chipping the bracelet — glass beads — on my desk . . . but if I wore it around my neck, it would be safe. So I had a jeweler remove the clasp and pulled another silk chord from my Etsy skein. Et voila! Lesson No. 5: The trick to matching a silk ribbon to gold (or silver or another metallic) is to go paler and greyer than the actual color you are trying to match. This approach is similar to the science of picking paint colors for your walls. Remember: That tiny swatch of color will be much brighter and lighter on the wall. Isn’t this fabric beautiful? It looks pixels, like the dress is slowly being actualized. It also reminds me of Klimt’s portrait of Adele Bloch-Bauer. * The trouble starts when you have more than one party dress for each season. That’s excessive, unless you go to a lot of fancy events. ** I remember visiting the Tutankhamun Treasures at the Museum of Fine Arts in Boston as a child like it was yesterday. *** I was not angling for the bracelet. I only admired it. I think my dear friend concluded that I liked it more than she did. I read somewhere recently about someone North American talking about living in another culture (Middle Eastern I think), where admiring something is enough to essentially require the owner to give it to you unless you use the special phrase that basically says “I like that thing but God has willed that you have it so it is ok that you keep it”. I love this, Allison, and will remember it for the future! 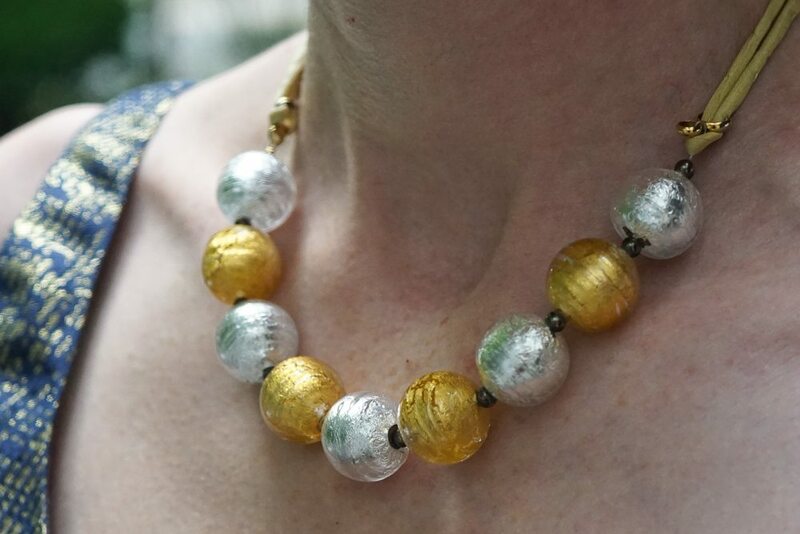 This is a terrific way to alter jewelry to the length you want. Much better than those little metal extenders. Could you please discuss that purse in a future post? It looks lovely. Hello MsZ! The little bag is the Furla Metropolis. I wrote about it here and here. It’s been very handy for events where I don’t want a big bag, but also don’t want the inconvenience of a clutch. I know! I can’t stop laughing about it. I know people justify a lot of things in the name of religion, but this one totally cracks me up. Terrific dresses! I bow to the teacher on the jewellery lessons. Will try out immediately. 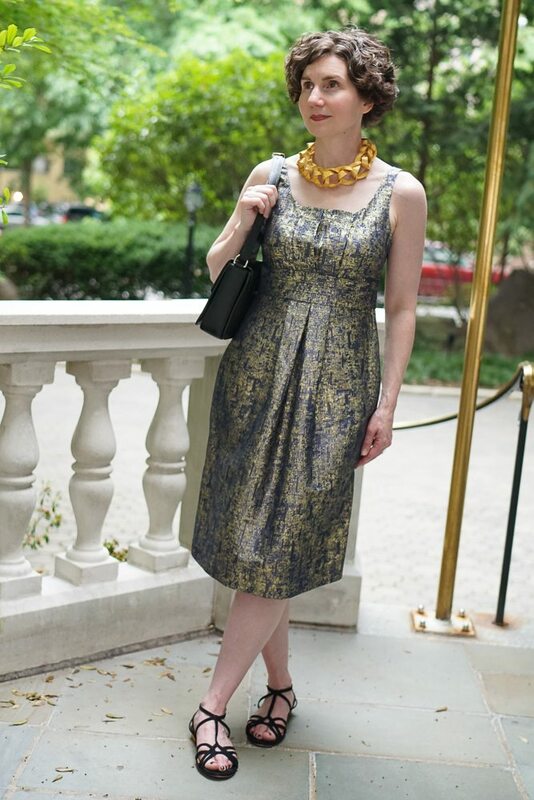 Now my two cents on the golden dress (beautiful on you): How about some cracked gold slingbacks? This dress says heels to me. Likewise, the black bag is perfect for the first black dress, but somehow looks too heavy for the gold dress. Purple clutch? Or a straw clutch? Tricky. The second dress looks COMPLETELY different with the second necklace. That was such a great demonstration of how jewelry can change a look. 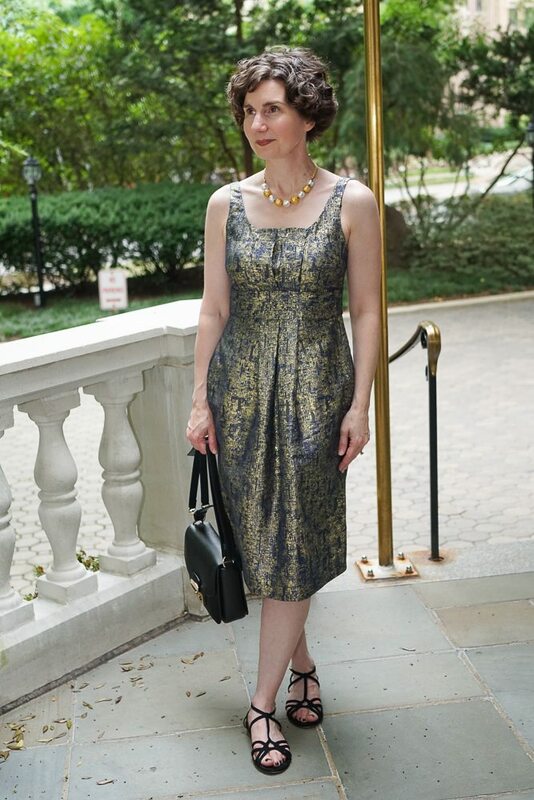 I like the more dainty necklace with the very flattering neckline – and the rest of the dress may not be svelte, but it’s very pretty. And the fabric is magical. Clever, Directrice! Very clever jewelry adaptations. I’m impressed. Also, I love both dresses. They are both stunning outfits! I’m awed by your cleverness. 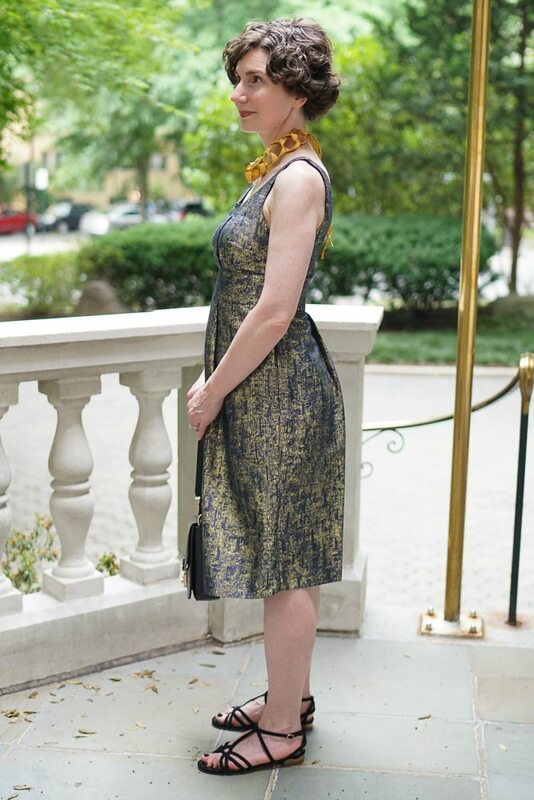 And I also agree that gold shoes with either dress would produce entirely different looks. Well done! I love both necklaces and the brilliance of your jewellery alterations. Both dresses are great on you. 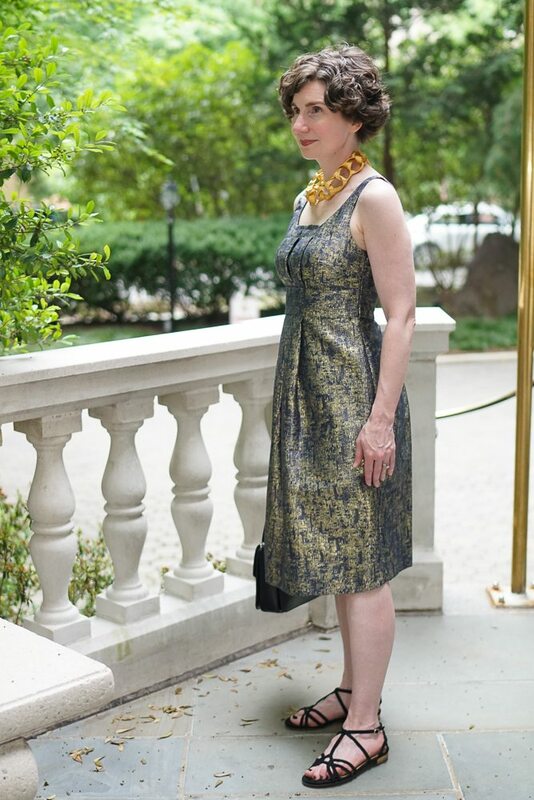 I think the all black and gold combination is wonderful; when you swap dresses, the outfit works because necklace, sandals (by virtue of their blackness, & despite not being heavy), and bag all work together to ground the dress and create a more staid and serious outfit than the dress warrants in itself. 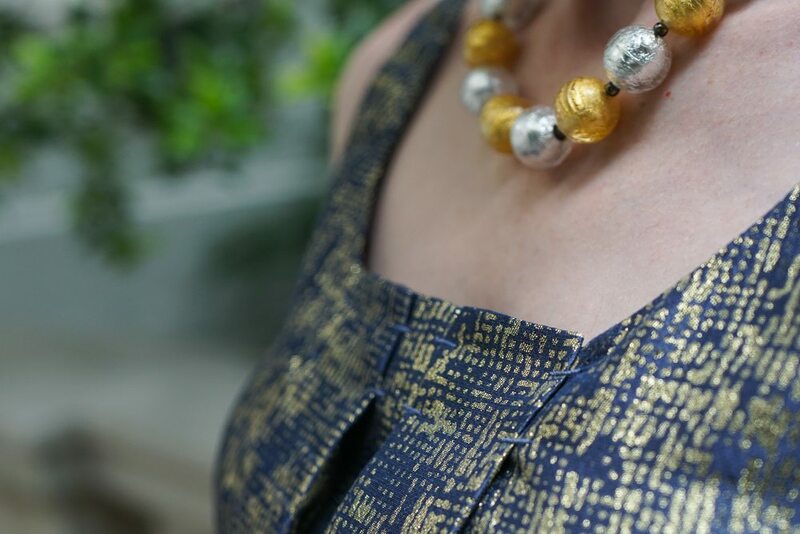 When you swap necklaces, it is as though you are allowing the metallic and purple dress to bloom upwards in to its full, beautiful, and delicate self. In this case, I really want you to swap to rest of your accessories as well; it looks as though you are wearing the black sandals and bag because you have no other options that don’t actively clash (ask me how I know that feeling), rather than because you had selected them as being the right ones. I want you to be wearing non-black sandals; grey, some browns, purple, maybe dark blue, any of these may work. Best would be metallic sandals – which are always a good investment as they solve the neutral-but-not-black sandal conundrum for almost any outfit imaginable. The thing I really want Jessiejessy, is one of those lucite clutches with gold glitter or sequins inside. Do you know what I mean? But I am not sure that I can justify the purchase. Metallic sandals, however, are very easy to justify because they do go with many things. Thank you for your wonderful commentary and suggestions! Yes! A lucite & glitter clutch would be so lovely. Maybe it could be justified on some occasion when you are supposed to receive a gift…? I just love fooling around with jewelry. I have to watch myself in craft stores, I have all kinds of odds and ends of things to change necklaces I’ve picked up. I get things taken apart and then it’s forever before they’re back together again. I have a round face so I like my necklaces to fall a little farther down to give me an oval shape so extending them is always an interest. 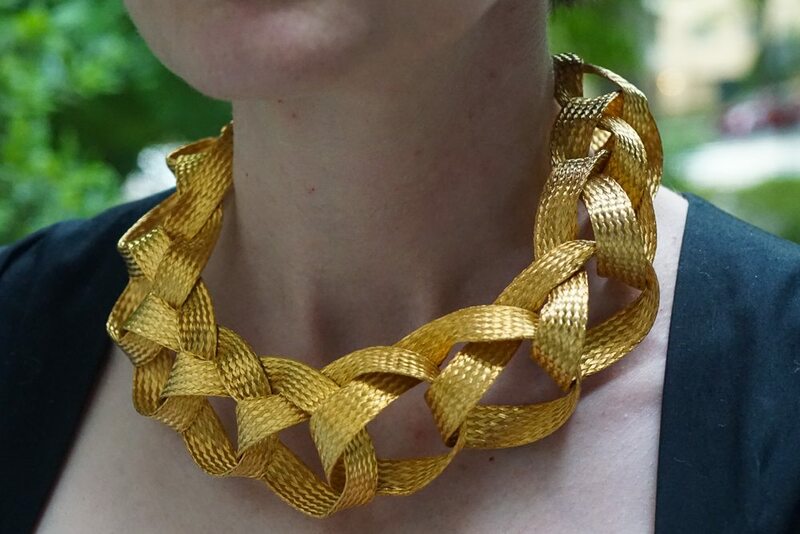 I would consider a thicker ribbon, maybe even velvet for cooler months, on the chunky gold necklace for a different look. I feel like the chunky links would stand with a thicker ribbon. 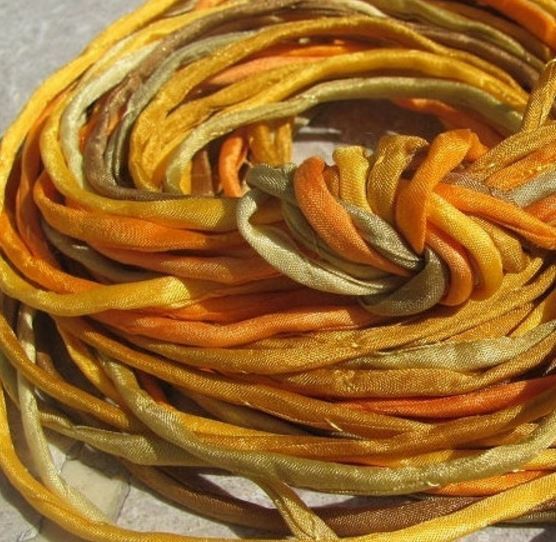 GingerR, I was thinking a wide ribbon that has a gauzy quality — so that it would fit through the eyes, but then spring out — would be very pretty. How do you keep all of the pieces of your dismembered necklaces organized? I feel like I would put them “someplace I’ll never forget” and then forget where I’ve squirreled them away. Or that I’d forget what pieces went with what.